The easy sell private mortgage. Introducing Ontario's first borrower-friendly Private Mortgage Product. 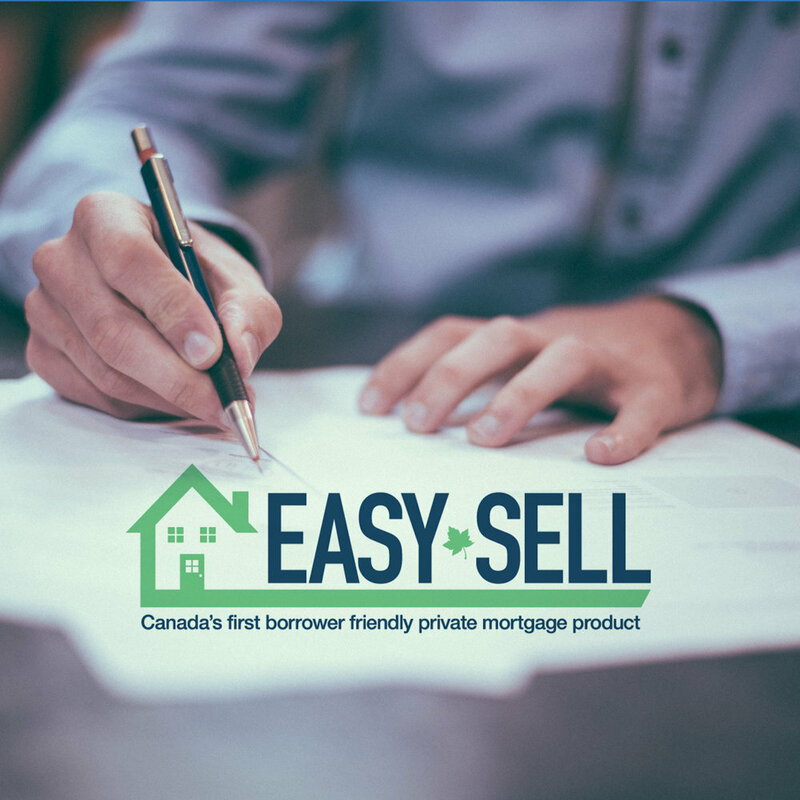 The Easiest Private Mortgage to sell in Canada. Agents and brokers the wait is over. Finally you have access to a private mortgage product that caters to both your needs and your customers. Easy Sell is a mortgage product like no other. It takes out all the hassles and snags we see in the industry and streamlines everything without compromising rate or approval restrictions. Easy Sell is flexible, competitive, fast and forgiving. Simply close more deals faster with Easy Sell. EasySell is easy to sell because there's no bulls#*t involved. No rush fees, no pre-payment penalties, no renewal premiums, no hidden fees, and no surprises in the fine print. One rate, one lender fee. Simple. We took everything else out and replaced it with value-adds that make it easier for you to close more deals. Adjustable monthly payments make EasySell work for borrowers. Your clients have circumstances and we have solutions. We’ll work with you to create a monthly payment structure that works within their means. If the real estate the borrower owns is marketable, we won’t overlook it just because of it’s location. Properties that are rural, or in a small town get the same consideration as ones in larger centres and rental properties, condos and cottages do too. EasySell is a fit for every credit score. We don’t live in the past. Borrower history is important, but not paramount. Easy Sell gives borrowers with credit challenges the benefit of the doubt. Your borrower can use the funds they get through EasySell however they want. As long as you aren’t taking down walls in the house or using the money to support criminal activity, we don’t put any restrictions on how you want to utilize the money we lend you. Get approved right away, over the phone. When the need for private money arises, time is always of the essence. You’ll hear from us within 4 hours of applying and we’ll endeavour to approve or decline your request the same day. Appraisal reimbursement gets the relationship started. When you close a deal with EasySell, we’ll send a cheque to the borrower reimbursing them for 50% of the cost of their appraisal. It’s a nice way to start the relationship and a great perk for you to offer your clients that they can’t get anywhere else. Standard Rates. Fixed Lender Fees. Easy to sell. It’s easier to sell rates and fees to borrowers when you know exactly what to expect. EasySell 1st mortgages are priced at 7.50% interest. 2nd mortgages are priced at 9.50%. The EasySell lender fee is the same on every deal - 3.50% or $3,500, whichever is greater. EasySell is priced right and when you factor in the appraisal reimbursement and no pre-payment penalties, the product has more added value than any other private mortgage product nationwide. Documents & Payment Processing makes life easier for everyone. Post dated cheques were cool in 1989. Not so much in 2019. The EasySell process is fully optimized to make paperwork and payment processing easy for everyone involved. You don’t have to take paperwork to the borrower, we’ll send it to you electronically to review and acknowledge it and as soon as you do the system will automatically forward it to your client for authorization. They can accept the mortgage from their phone! It’s quick and painless the way it should be. Experience the benefits of dedicated, efficient underwriting. EasySell underwriters work as a team so that you always get connected to the first one available when you have a new deal to discuss. Once connected though, the underwriter you talk to first will remain dedicated to your file until it closes. Download The printable PDF outline of the EasySell Mortgage here.